Once, not too long ago, the German prestige brands looked down their noses at the idea of a five-door hatchback bodyshape in the compact executive segment. They left that sort of thing to mainstream Mondeos and Vauxhall Insignias. 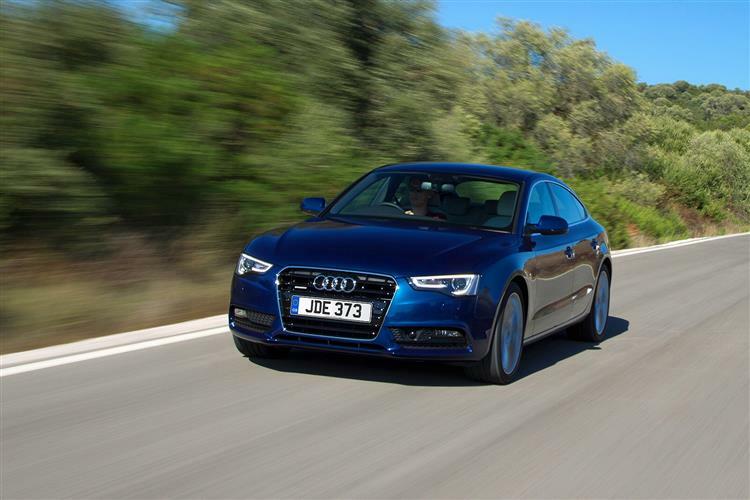 Audi changed all that with the launch of their A5 Sportback model in 2009. All of a sudden, target business buyers realised that a nicely styled hatchback could look very coupe-like, which, especially in business circles, was exactly what an increasing number of buyers were looking for. The style of a sportscar: yet to keep the Fleet Manager and/or your partner happy, the practicality of having four passenger doors. A5s run on Audi A4 mechanicals, so this is essentially the A4 hatchback that that the German brand could never be seen to build. Late 2011 saw this car get a whole range of detail improvements - more efficient engines, extra hi-tech equipment and the three-person rear seat option it should have had in the first place. This revised version lasted until late 2016 when an all-new second generation model was launched. 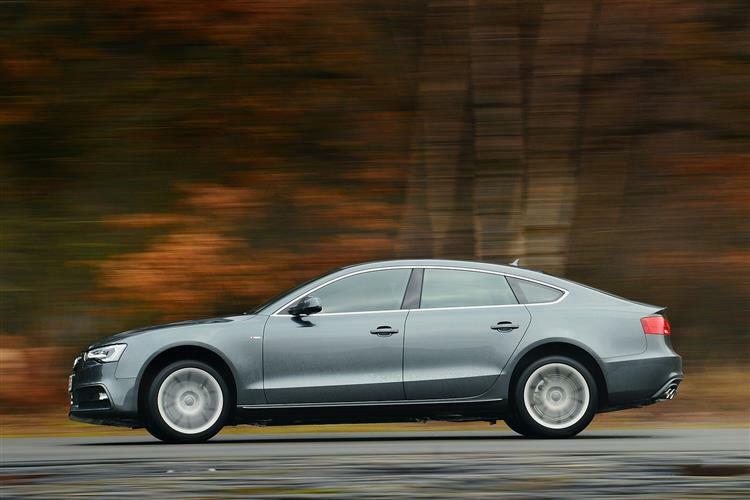 Imagine what an A4 saloon might look like if it had a hatchback, was slightly wider and lower and had an A5 coupe nose and you're pretty much picturing this Sportback model. To be fair, you wouldn't necessarily immediately guess its A4 ancestry from a casual glance. This design, though just 11mm longer, is a significant 28mm wider and has the A5 coupe model's wavy waistline and frameless doors. The revised post-2012 MK1 model version we're looking at here features a sharper-looking set of wedgy A6-style headlamps. On 'S line' and top of the range models, these are surrounded by smart LED strip daytime running lights. Other MK1 model facelift revisions included a cleaner-looking single-frame front grille, as well as tweaks to the front bumper and the bonnet. The more angular tail lights were re-styled too and used brighter LED technology. Perhaps more significantly, from just before the time of this facelift, Audi decided to offer buyers from new the option of a three-person rear seat on all Sportback variants save the S5: look for used examples fitted with this feature. Perhaps the reason Audi didn't make this option available earlier was down to the inconvenient central transmission tunnel this car must have, despite the fact that it's front wheel drive. Not ideal then for an adult centre rear seat occupant, but fine if you've got three kids. For two adults in the back, legroom will be quite adequate and, contrary to expectations, rear headroom isn't too compromised by the sloping coupe-style roof. And behind the wheel? Well, it's as beautifully finished as ever, tailored like a sleek-fitting suit, everything being clear and elegant. This improved model got revised steering wheel designs, beefier column stalks, clearer white-illuminated instrumentation displays, neat chrome detailing, updated buttons, smarter upholstery and some fresh interior finish choices - one rather curiously titled 'poetry' that includes rather lovely yacht-deck style wood inlays. The optional MMI infotainment system was also easier to use, with fewer buttons and more logical menus (you can even put in a 7-digit postcode into the sat nav). Through it, you can access a whole raft of online options, everything from Google Earth mapping to in-car internet access. Luggage space in the long, flat loading bay is pretty much the same as you'd get in an A4 saloon or Avant estate, 480-litres to be exact. Some models you'll find will have been fitted with an optional ski-hatch for longer items. If that's not enough, you can extend the space available to 1263-litres by lowering the split-folding rear seat backs. A neat touch is the 70/30 split luggage cover, the larger part permanently attached to the tailgate so that it lifts out of the way when the hatch is raised. The remaining 30% is a small, hinged shelf which offers easy access to the boot space. On the negative side, the tailgate opens from quite a high loading lip, does without a rear wiper and lifts so high that it might be difficult for shorter owners to lower. 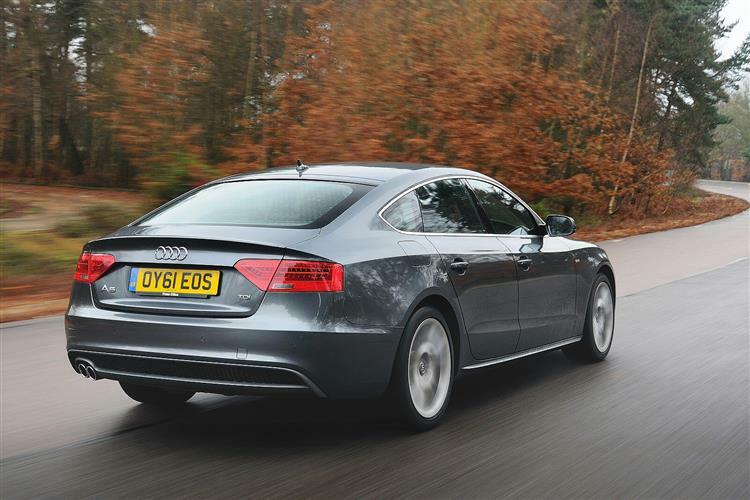 As a whole, Audi A5 Sportback owners seem to be a pretty satisfied lot, though we did come across a few issues in our survey. Most seemed to relate to electrical problems. A number of owners have experienced issues with the electric window mechanism, so check that. One owner had a problem with the MMI infotainment system failing; another found dashboard rattles - and particular issues with rattly speakers. As for mechanical stuff, well, we found one owner who reported an oil light issue and a handful who had reported brake grinding issues. Corrosion is simply not an issue with Audis and another reason why resale values are high. Look for a fully stamped up service history and look for uneven tyre wear on the more powerful models. 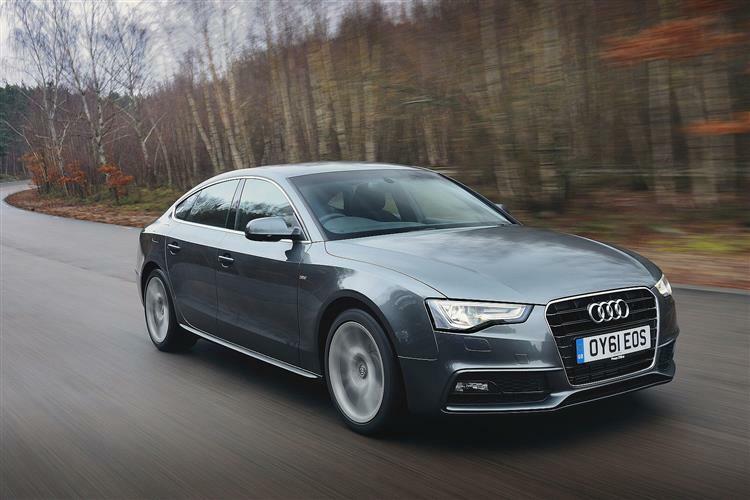 Since on paper, the A5 Sportback is exactly the same under the skin as any of Audi's A4 or A5 models, you might expect it to be little different from any of those cars to drive. In fact, that's not quite true for in its wisdom, Audi has decided to make this variant a little softer and 'GT'-like, which might not suit those used to the sharper, more focused approach of the A5 coupe. You could opt for a variant fitted with stiffer S line trim to try and sort this out but the end result is rather over-firm for British roads. A few models you'll find will have sorted this issue with the optional fitment of a CDC Continuous Damping Control system, this allowing you to match the ride to the road you're on and the mood you're in. 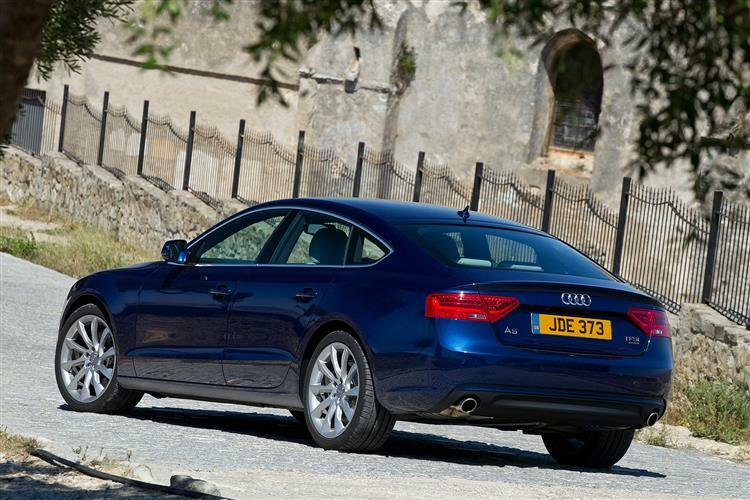 Other A5 Sportbacks were specified with the option of quattro four-wheel drive, tempting indeed given our wintry climate. Normally, this system distributes the engine's power primarily to the rear but if necessary, can redistribute torque towards the front at lightning speed. Opt for a variant fitted with the Sport differential that was available on the top 3.0 TDI and S5 models and torque can even be distributed from side to side at the rear, firing you from corner to corner. So far so good. What let the side down a bit though on the original version of this car was the steering and as a result, this revised version got an all-new hi-tech electromechanical set-up which was supposed to enhance driver feedback, though that's still not this car's strongest suit. Some original buyers tried to improve it by paying extra for 'dynamic steering'. 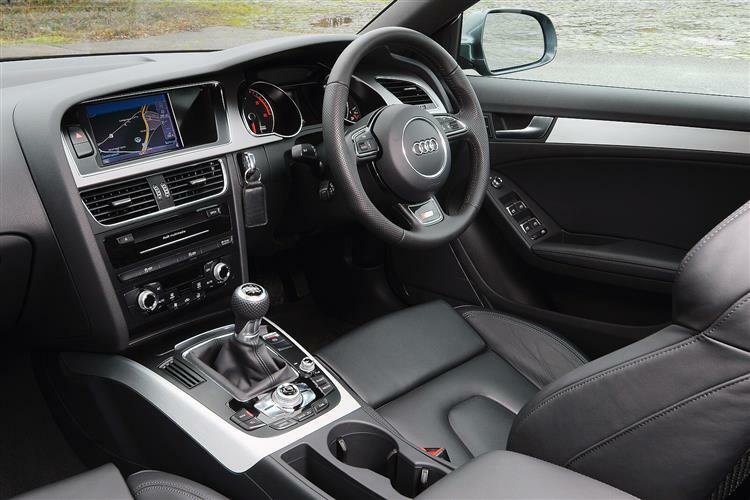 Most though, were happy to stick with Audi's optional 'Drive Select' system which tweaks steering feel along with engine management, auto gearbox response - even the air conditioning - in line with your choice of 'comfort', 'auto', 'dynamic' or even 'efficiency' modes. Under the bonnet, if you're an enthusiastic driver, less is probably more. With less weight to carry around, lower-order 2WD petrol and diesel models feel more agile and more responsive than their pokier 3.0-litre stablemates and we prefer the 6-speed manual transmission to the auto-only set-up you're limited to on pricier models. In the TFSI petrol line-up, even the entry-level 170PS 1.8-litre variant manages sixty in 8.2s on the way to 143mph. Beyond that, there's the venerable 211PS 2.0-litre unit from the Golf GTI, this offered with two or four wheel drive. For us, a 2.0 TFSI A5 capable of sixty in just 6.6s on the way to 150mph is pretty much the perfect package. 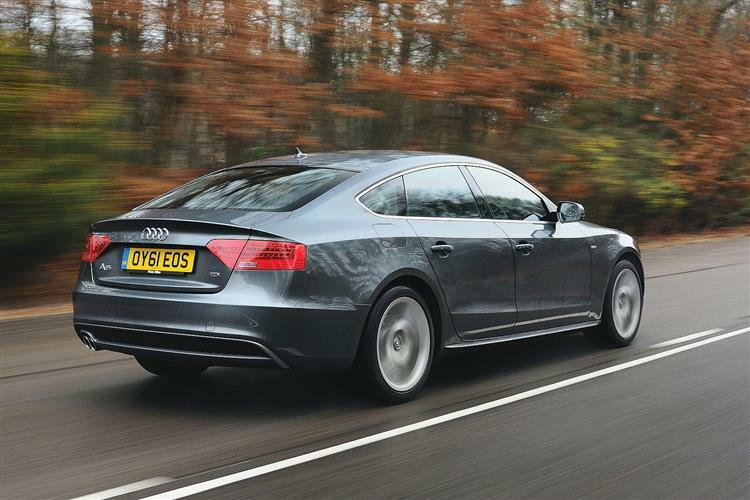 But most A5 Sportback buyers will be choosing a 2.0-litre TDI diesel. You can see why. It makes sense on the balance sheet and offers plenty of performance, the exact amount depending upon your choice between 136, 163 or 177PS outputs. Both the two quickest variants are capable of reaching sixty in around 8.5ss on the way to around 140mph and the fastest version is offered with the option of quattro 4WD. 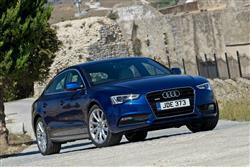 That only leaves the 3.0-litre models, two of them diesel-powered. 3.0 TDI buyers choose between a 204PS variant with two wheel drive and 8-speed Multitronic auto transmission, a surprisingly efficient package. Or a tempting 245PS 3.0 TDI quattro model with 7-speed s tronic auto transmission - a car that's really very quick indeed, sixty from rest occupying just 5.9s on the way to an artificially limited 155mph maximum. 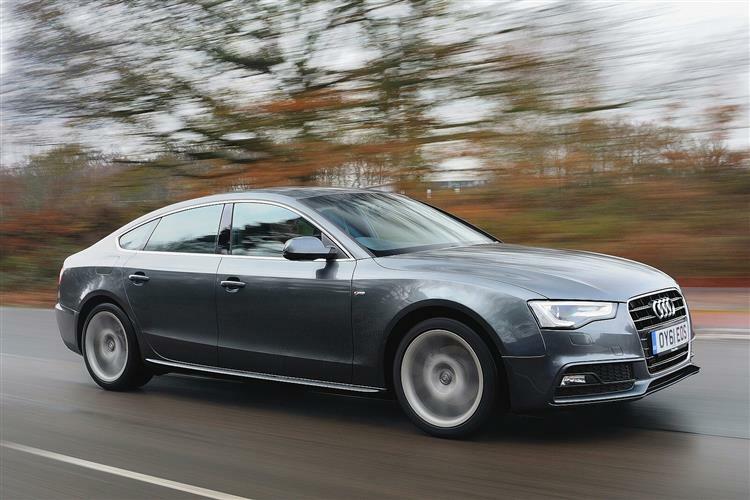 Or at least you'll think it is until you try the flagship S5 quattro model, powered by a 333PS version of the supercharged 3.0TFSI petrol unit borrowed from the S4 super-saloon. Here, sixty is just 5.1s away from rest. 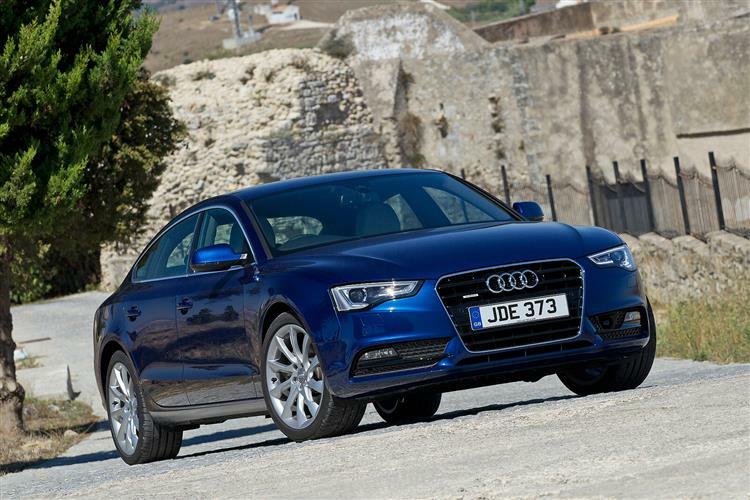 Audi proved with this A5 Sportback that there was room in the market for a compact executive saloon with a fifth door and an added dose of charisma. Whether the people buying them are actually conquest customers is another issue entirely of course but when you're offering models to suit every conceivable market niche, you can never be quite sure of that. This post-2012 revised version certainly stacks up on paper, with impressively low CO2, fuel economy and benefit-in-kind statistics - and unlike the original model, can potentially seat five people. Which makes it even harder to ignore if you're target market for this kind of car. One thing's certain: here's another very desirable Audi.